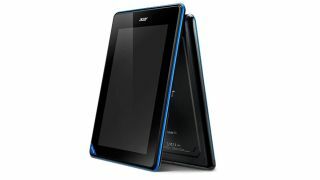 Acer has announced a 7-inch budget tablet next year, as the PC maker looks to expand its reach in the handheld market. The tablet, which has launched in India but sadly doesn't have much in the way of other worldwide release dates, features Android Jelly Bean at its heart, a Mediatek dual-core 1.2GHz processor and a 1024 x 600 resolution display. Going head to head with the likes of the Google Nexus 7 and Amazon Kindle Fire HD, Acer seems to be planning on stealing the show by offering the Iconia B1 for just £99 (around $60/AU$95). Other fun time specs include 8GB of internal memory with a microSD expansion slot, 512MB of RAM and a 2710mAh, with a weight of 320g. We have been told that the Iconia B1 will be coming to Europe later this month, and will cost €119 (around £99 / $155 / AUS$150) which is amazingly cheap for a tablet that brings the latest version of Google, despite not having much grunt to power it with. Acer isn't the only company supposedly planning a ridiculously cheap tablet, with several rumours surrounding a $99 Nexus 7 also refusing to go away. Check out our coverage of CES 2013 and our MWC 2013 preview to find out what their plans are for the 7-inch market, so stay tuned for more.